A wonder strike from Clyde midfielder Scott Banks completed the comeback for the home side. 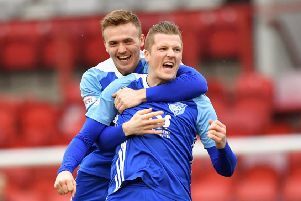 On a day where a win would see Peterhead further their lead at the top of the table, Clyde decided to spoil the party after they held the leaders to a draw. Peterhead had made one change to the starting line up that had beaten Cowdenbeath the previous week, Paul Willis making way for Rory McAllister. It was the visitors that started brighter. A third minute free kick by William Gibson was fired across the diving Blair Currie’s goal and into the bottom right hand corner. Clyde began to put men forward and they almost found themselves quickly on level terms through a Martin McNiff header. Unfortunately though it was off target. As the game went on the home side began to find their feet. A flurry of Clyde attacks resulted in a chance for Jack Boyle who fired a low shot at goal but it was blocked by Peterhead skipper Dunlop. Just as there was a sense of an equaliser coming for Clyde, Peterhead grabbed their second of the game. Scott Brown then found the feet of Paul Willis who kept his composure and slotted comfortably past the Clyde ‘keeper. Clyde found themselves in need of a goal and a great opportunity arose when Goodwillie stepped up to take a free kick, some confusion in the routine saw the effort blocked and the half time score was 0-2. A second half change saw Scott Banks replace Ray Grant. Straight away it proved to be an influential one. In the 47th minute Banks produced a cross which Goodwillie met, heading the home side back into the game. Five minutes after though, the Blue Toon scored again after Scott Brown found some room and fired a low shot into the Bully Wee net. 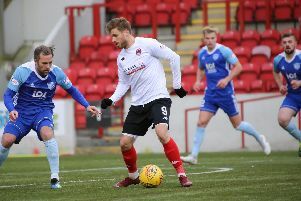 Clyde were then awarded a lifeline after a handball from Jason Brown allowed Goodwillie to score a penalty. Game on. The comeback was completed when substitute Scott Banks took aim from 25 yards finding the top left hand corner.